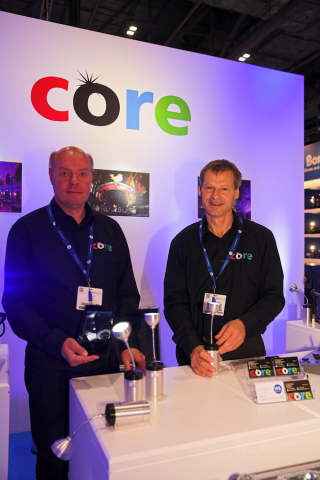 Wireless battery powered lighting manufacturers CORE Lighting report a PLASA 2014 exhibition at London’s ExCeL Centre, which they will launch the new PinPoint fixture. Already in production, the tiny IP65 rated wireless pin-spot / birdie weighs 700 grams while its single LED lightsource outputs a punchy 300 lumens. The head is connected to the base of the PinPoint via a flexible stainless steel 'gooseneck' for maximum focusability, and the brushed aluminium housing gives a contemporary, streamlined finish for any environment. Further options are added with the base capable of vertical or horizontal orientation making it ideal for sitting on shelves. The base is magnetic for easy clamping to metal objects of all types - including lighting, sound and video mixing consoles and control equipment - where it can provide working light in awkward and challenging spaces. PinPoint is designed to be used as feature lighting for events of all types and specifically to highlight table centrepieces, floral arrangements and other scenarios that need tight, detailed spot-lighting. The standard battery life when fully charged will give 14 hours of illumination, and an expediently sized flightcase of 10 units offers total portability for a PinPoint system including an integral charging facility. PinPoint is versatile and cost-effective for staging or supplying events. In addition to the PinPoint, CORE showed its flagship POINT30, ColourPoint and FLOOD30 fixtures at the show – all of which were well received. The ColourPoint is a lightweight lithium battery powered LED event up-lighter with full wireless DMX control. It is IP65 rated for outdoor use and offers 2000 lumen output ideal for lighting up to 3 storeys of architecture / buildings / space, medium sized trees and foliage and wall-washing in marquee tents & buildings. Utilizing the latest quad-chip RGBW technology the color mixing is smooth and homogenized and, as with all CORE products, it’s robustly built to withstand life on the road. The workhorse CORE POINT30 is an IP65 rated high-brightness, high-colour battery powered architectural LED uplighter with wireless control. It has an extremely high brightness of 2500 lumens and will light up trees, architectural features, pathways, monuments, building facades, marquees etc. The unit is housed in a compact and rugged 25 cm case and weighs just 8 Kg. POINT30s can also be powered and charged from mains electricity. The FLOOD30 is for high brightness outdoor applications needing a serious amount of light output – battery powered and IP65 rated, its potent neutral white LEDs produce over 7500 lumens – equivalent to a 750W tungsten halogen source – but for a fraction of the running costs and in a highly convenient and easy to rig package. The FLOOD30 provides instant light where no power is available and can illuminate distances of up to 100 metres. The head folds flat for stowage and protection during transportation and can be removed for mounting on a multiple accessories including a tripod / pole system which is attached to the base. A mains-powered version of the FLOOD30 is also available for fixed installations.